Is SideFX's latest release up to scratch? A fantastic range of new tools and features added, including the excellent Vellum. Some serious users of Houdini might say that the software is more of a 3D operating system, because of its complexity and versatility. The newest release, 17 or Banshee, is the heaviest release in recent years. 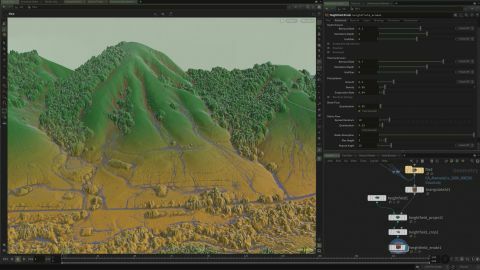 As usual, the dev team at SideFX have focused mostly on the effects modules, but have also touched on almost all other parts of Houdini, so just listing all of the new features and enhancements would take a while. As you may have noticed in previous releases, many new features are ‘by TDs, for TDs’ kind of tools and the low-level, hard-coded ones are throttled back. It’s the same with this version, and we’ve got quite a few new, ready-to-cook shelf tools that will help you create stunning 3D art. One of the best is the new Whitewater tool, which realistically simulates self collision, cohesion etc for all foam, spray and bubble effects emitted from any kind of FLIP simulations. In the previous versions it was a much simpler particle system. There was always the opportunity to enhance the simulation with custom modifications or even custom solvers, but usually the rush of a production doesn’t allow for such fidelity chasing, which ends up with 'looks good, but I feel that something is wrong' results. On top of this, clients are looking for rapid results, so features such as a one-click Perfect Storm tool can be a real advantage, at least as a high-level starting point. In Houdini the TD work, node network building and coding are friends, not enemies. Most of the simulation and procedural tools are put together by TDs at SideFX, with high-level node networks inside. These are based on deeper-level node networks, either with top-down operators and left-right VOPs. The coded nodes can be open source (VEX, the programming language of Houdini and OpenCL) or ‘baked’ ones. The solvers themselves work in this way, thus the nodes and tools that come with Vellum – the biggest new feature in this release – are fully transparent, like the Pyro and other solvers, and aren’t black boxes as is the case in other software. We can dive into them, even unlock and modify or rebuild these networks inside. For problem solving, the opportunity to rewire almost anything in Houdini feels for me much more natural and direct than writing code, as basically there are circuits connected to each other in the computer’s memory and processor. I think this is the most fundamental advantage of Houdini compared with many other 3D packages. The disadvantage of this node-based open architecture is that in simpler scenes it feels slower than a similar one in a hard-coded software. However, with heavy scenes the extra processing time consumed by the node-based architecture is relatively insignificant. Furthermore, the low-level VOP networks can perform as fast as a hard-coded module. Vellum is a brand-new, GPU-accelerated multi-physics engine based on the new XPBD model, a particle-based dynamics system for a broad range of usage. There are Vellum shelf tools for cloth, inflated objects, hair, grains and a faster alternative for simulations where we used FEM before, like tissue and other soft bodies. Luckily, Vellum nodes are also available in the SOP context, so it’s convenient to use them for simulation-based modelling or to simplify the scene structure, without the need for a separate DOP network. As a look dev/lighting artist, I have used software such as Maya, 3ds Max and Clarisse in production, but have often found myself in a situation where I felt them to be quite restrictive. However, the weakest area of Houdini is still the UI and user-software interaction in general. SideFX has enhanced them a lot during the last decade, but there are still annoying flaws with the viewports, the IPR and some other functions are quite laggy (the Esc key and Manual update are our friends), especially when comparing with Clarisse. Coming from Maya, many parts of the docs felt weak and unhelpful. It seems that VFX artists just can’t get away from software-related frustrations. That’s why I went back periodically to other software and did not transition fully to Houdini. The final decisive factor that made me put those other software aside though was stability issues. The most annoying thing is having to restart and reload the scene every few minutes. Of course Houdini isn’t bug-free – in H17 I ran into multiple crashes and broken features which work fine in H16.5 – but usually as time goes on the dev team at SideFX really consider the bug reports and release bug fixes on a daily basis, and a new production build every month. The customer support is great, and every time I received quick and helpful answers. The community and the resources on the internet are also bold and helpful – as it should be.